I switched computers today to do some Xcode development. (Yes, I am trying to learn iOS development using Objective-C). I had everything setup on my MacBook Pro but I wanted to do Xcode development on the new iMac I got. My sample iPhone app that I am building was working fine in the simulator. Problems started when I wanted to try it on the actual device. In the Xcode organizer window, this is what it shows. So, I thought, OK, I am missing the developer profile. So, I went into the Organizer window, click on Library -> Provisioning Profiles on the left hand navigation, clicked “Automatic Device Provisioning” checkbox at the bottom of the window and hit the “Refresh” button, assuming that this will download my profile and install everything that’s needed. However, that was not the case. After some struggling around with the issue and reading Apple’s resolution guide, I figured out that I need to export my certificate from the old computer and import it into the new one. That way, it will bring across the certificate along with the private key. What Xcode Organizer does is, it only installs the certificate but the private key file is missing. 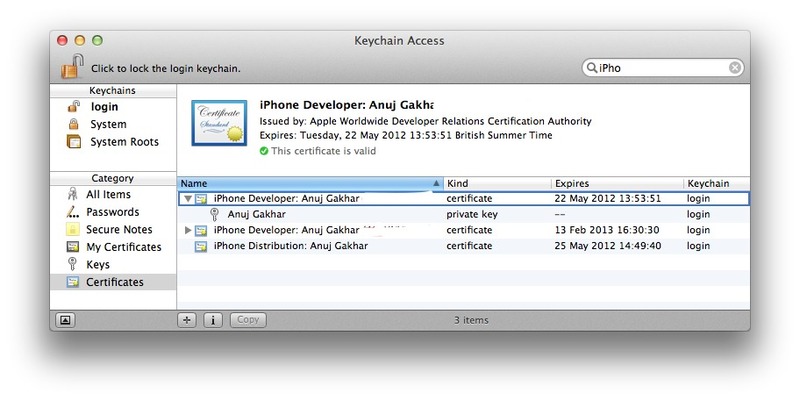 Launch the KeyChain application and click on “Certificates” in the left navigation. Type in “iPhone” in the top search bar to filter the results. Then right click on your valid certificate and export it. Export the valid certificate, Xcode will ask for a password. This is a new password that you set for this export process. This is not the password you set when you first created the certificate. So do this and this will then generate a .p12 file. Copy the .p12 over to your new computer and drag it on to KeyChain app. KeyChain will ask for the password that you set during the Export process. Enter the password and that’s it! No More “Valid Signing Identity not found” errors in Xcode Organizer. Now you can deploy your app to your device, like usual. Thank you!!! I had this exact problem tonight (developing iOS on a MBP, wanted to try it on my iMac), and I was just about to revoke my certs and reinstall when I saw your post. I haven’t changed computers – my provisional profiles recently expired but, after I renewed them, I’m getting the message “Valid Signing Identity not found” in the organizer. I’ve tried to re-issue my certificates and I see them in the login keychain but the error message remains. Any ideas? Excuse me, but where U can find the keychain app? I don’t have it in the utilities folder. Thanks a million! This solved a puzzle that I had been wrestling with for some time!! !